With a career like Larry Nixon has had; a certified legend in the sport of bass fishing, there is only one outcome when fishing a season ending championship like the Forrest Wood Cup that matters. When you’ve won the Bassmaster Classic, two Bassmaster Angler of the Year titles, you are the first angler to earn a million dollars in Bassmaster history, you have won four FLW Tour events and have amassed nearly $1.6-million in FLW earnings; you only have one goal. Winning the 2013 Forrest Wood Cup on the red River out of Shreveport / Bossier City, La. is the only outcome that truly matters. As far as a career perspective goes, a second place finish means nothing to your career résumé, so you sell out completely, and go for the win. From a career perspective, every chance you get to walk across the biggest stage your league provides and feel the adoration of its fans; those memories are priceless; only surpassed by celebrating a win with them. So, you sell out and give everything you have for that goal, every decision is made with the win at heart, and it starts with how you practice. He contacted Gary Yamamoto Custom baits and had them send as many Yamamoto Kreatures in Blue Pearl Silver Flake as he could get. He would use those as his primary weapon, but mix in a green pumpkin “hog’ as he called it with the tails dipped chartreuse, especially when in the backwaters. Nixon knew that things were going to be tough when the competitors ventured out for the first day of competition. The area had received an unusual cold front that had come in on the day before the event that came in from the north. With cooler temperatures, brief periods of heavy rains and a falling barometer, the fish were likely to be put off. He was able to find enough bites to put together a 13-pound, 4-ounce limit that landed him in third place. The trouble with his third place finish was that two anglers, Randall Tharp and Bryan Thrift both caught limits that eclipsed 18 pounds; Nixon had some ground to make up. Day Two would prove to be Nixon’s best day in the weight department. he arrived at his starting spot in White House to find that the silt had moved deeper through the area, and midway through the day, he found himself in the position to make a move to his backup program. His 14-pound, 5-ounce limit kept him in third place, but with Tharp and Thrift slipping, he found himself just over two pounds behind the leader with 27 pounds, 9 ounces. had produced the day before. However, he made a miscalculation. He caught a limit weighing 8 pounds, 5 ounces and pushed his overall weight to 35 pounds, 14 ounces; good enough to remain in third place, but he fell two more pounds behind Thrift and Tharp. He knew he had some ground to make up. He went to the river, put a six pound limit in the boat, then went back to the backwaters, where he was able to catch a bigger fish and cull up to 8 pounds, 6 ounces. It pushed his total to 44 pounds, 4 ounces; and dropped him to fifth place. 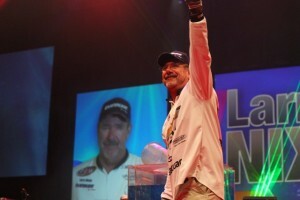 He relied on three primary lures for his top five finish on the Red River. The primary weapon was the Blue Pearl / Silver Flake Yamamoto Kreature, and his other two were a green pumpkin “Hog,” as he called it, with the tail dipped chartreuse, and a SPRO Frog on day four. He used a Dobyns Champion Series 735 with 6.1:1 retrieve speed reel and 15-pound-test Seaguar Invizx fluorocarbon line with n 1/8 to 3/16-ounce sinker for the Kreature. He used the same rod and reel, but increased the line to 17-pound-test Seaguar Invizx for the “Hog,” with a 5/16 to 3/8-ounce sinker. He said he swam the Hog around cover, then let it fall into holes in the grass etc. His frog gear was a Dobyns Champion Series 736 and the 6.1:1 reel that he spooled with 60-pound-test white Seaguar Kanzen Braid which he colored black with a permanent marker to help camouflage the line.